When I think of Sears, I think of Bob Vila and his haplless rival, Tim “The Tool Man” Taylor. You probably have a different word association, but I can guarantee you this: If you grew up in 20th-century America, the word “Sears” puts a specific mental image in your head, and that image very likely depends on your age and father’s location on the handyman spectrum. The history of Sears provides a textbook example of a company’s life cycle. First, you start out with an innovative idea. The company pioneered mail-order catalogs as we switched from the 19th to 20th century. Later, Sears department stores spread across America’s growing suburban landscapes during the company’s heydays of the 1960s and 70s, and a trip to Sears became a requirement of the holiday shopping season. The company’s annual sales first hit $1B in 1966 and quickly grew to $20B by 1984. Soaring profits and executive hubris tempted Sears to dabble in several industries over the years. The company tried its hand in insurance (Allstate), real estate (Coldwell Banker), credit cards (Discover), stock brokerage (Dean Witter), and even tech (Prodigy). Many of these ventures were sold off in the 1990s, but the damage had been done. Like an overextended military, the resources devoted to new fronts had left its retail core vulnerable to attacks. The first blow came from the big box retailers, led most visibly by Wal-Mart, whose empire exploded through the 1990s and early 2000s. 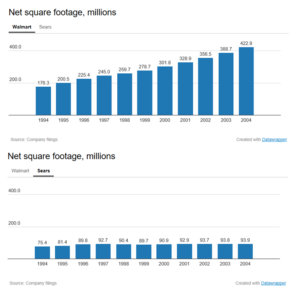 As Wal-Mart’s geographic footprint grew, so did their share of retail profits, and who better to take those profits from than the old guard? In an ironic twist, however, the fatal blow would come from a competitor with virtually no physical retail presence. Perhaps fittingly, a 21st-century update to Sears’ original innovation drove the final nail in their coffin. Amazon brought the mail-order catalog to the virtual world where it could offer greater selection, cheaper prices, convenient delivery and customer reviews. This value proposition was too great for Sears to compete. A 2005 acquisition of Kmart more than doubled sales but simply reset Sears’ final descent from a higher altitude. Companies file for bankruptcy when they can no longer repay their debts, and it takes cash to repay those debts. One thing 21st-century Sears excelled at was burning through cash. Like sand through the hour glass, this cash burn signals a countdown to bankruptcy. 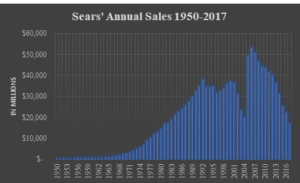 The last year Sears earned a profit was 2010. That was also the last year their business operations generated cash. Since then, money was leaving company coffers too quickly for falling revenues to replenish. A cash-burning company has three options to fend off bankruptcy. First, the company can improve its business model to the point where it generates cash rather than depleting it. This seems obvious, but good luck stealing profits from Wal-Mart and Amazon. In the meantime, the clock is ticking, and debts are coming due. Plan B is to borrow more. Pay off your old debts by borrowing anew. This buys time but doesn’t solve the underlying problem. In fact, this vicious cycle can feed on itself. 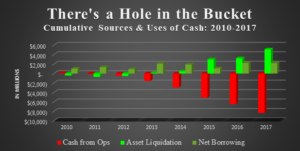 It takes more and more borrowing just to break even because the debt accrues interest and day-to-day operations keep bleeding cash. 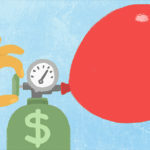 As debts grow, creditors charge higher and higher rates of interest, and you always face the risk that lenders will simply cut you off. 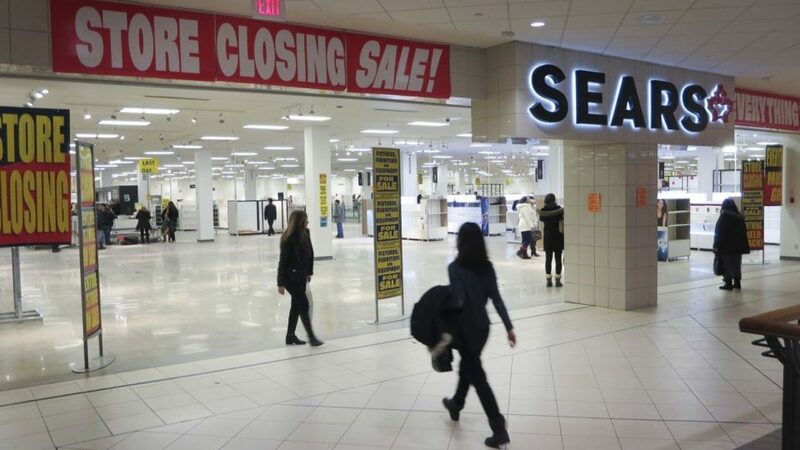 Sears borrowed money and sold assets to replace the cash being lost in day-to-day operations. This delayed but could not prevent their demise. Image via: author. Data via: Sears financial statements. Finally, a firm could raise cash by selling assets. This is not a growth strategy, but if you find yourself with hundreds of unprofitable stores, why not sell the bad apples? That is precisely what Sears did. The company shed over 1,000 Kmart and Sears stores between 2012 and 2017. 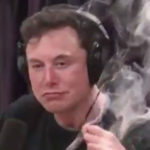 Still, these liquidations couldn’t keep up with the cash burn, and they were running out of stores to sell. Finally, Sears had to face the music. The jig was up. The torch was passed. Sears served its role in the evolution of our economy, providing retail shoppers the best version of retail until an even better version came along. Such creative destruction is the central force driving economic growth. Profits encourage entrepreneurs to displace the incumbents with better products at lower costs, creating new business models and destroying old ones. Cars replaced carriages. The iPhone replaced Kodak. Amazon is replacing department stores. Society benefits at the cost of those being replaced, be they companies or individuals. So develop your skills. Make yourself irreplaceable. The great social challenge of the next 50 years will be figuring out how much we’re willing and how much we’re able to help those left behind in the wake of innovation.